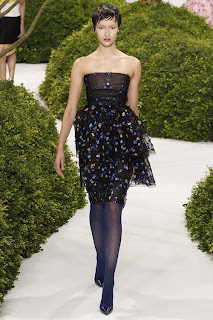 The second collection by newcomer Raf Simons for Christian Dior was predictably wonderful. With a backbone theme of a far far away land, Raf made magic happen by taking Dior’s traditional aspects of fashion, such as monochrome tones and royal-worthy gowns, and blending it with an edgier touch such a layering. Take a look at our favourite look from the SS13 couture collection just shown in Paris.